With more Apple laptops with USB-C on the market and in people’s hands and the relatively high cost of Apple’s AC adapters, it’s natural to seek alternatives. 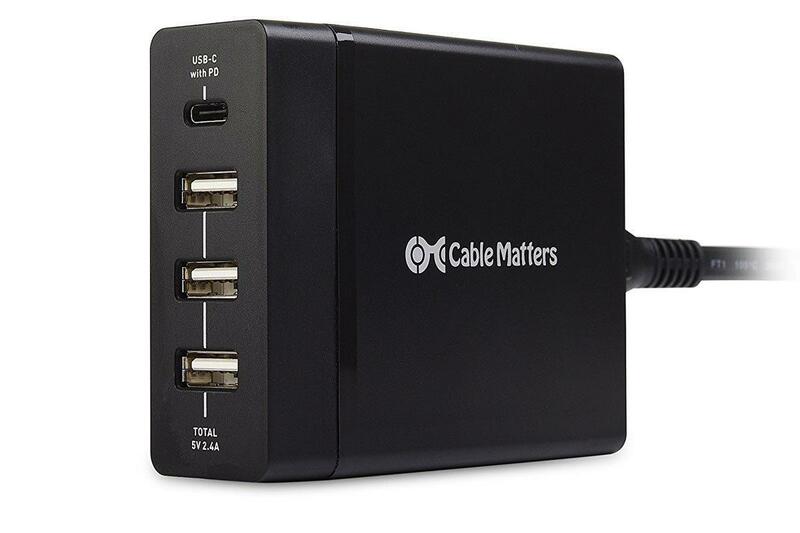 Cable Matter’s 72W 4-Port USB Charger with USB-C Power Delivery ($49.99 MSRP; $29 on Amazon in black or white>) has a 60W jack for USB-C and shares 12W (5V at 2.4A) among its three USB Type-A ports. Its low price, compactness, and features makes it a great travel or replacement charger. USB-C allows the use of Power Delivery 2.0 (part of the USB spec), which can provide a variety of voltages and amperages to charge higher-wattage devices, like Apple’s 12-inch MacBook and the 2016 and 2017 MacBook Pro models. They vary in power requirements from 29W for the MacBook to 45W, 60W, 61W, 85W, and 87W (whew!) for the various MacBook Pros. At 60W, the Cable Matters charger can handle all of these, though it won’t charge the largest MacBook Pros at full speed. Keep that in mind if you’re always needing a fast battery charge. The USB-C port will also deliver high-wattage power to other devices with PD 2.0 support, and at up to 15W (5V at 3A) for USB-C hardware that lacks it. It explicitly doesn’t support Apple’s Lightning to USB-C cable for the iPad Pro, which is true of other non-Apple adapters, unfortunately. The 72W 4-Port USB Charger with USB-C Power Delivery is also availabel in white. On the USB-A side, splitting 5V at up to 2.4A (12W) among three ports seems a little sparing, given that you could have multiple devices that can charge at 2A (10W) or more. However, plugging in an iPhone and iPad will charge both at the same rate, and the iPhone will finish first. At that point, the iPad will ramp up to its full speed. I tested the ports with power flow monitors, and they performed as advertised. Because this is a device with USB-C, you might be tempted to think it should handle data as well as power. It can’t, which isn’t unusual. It’s purely a charging device. 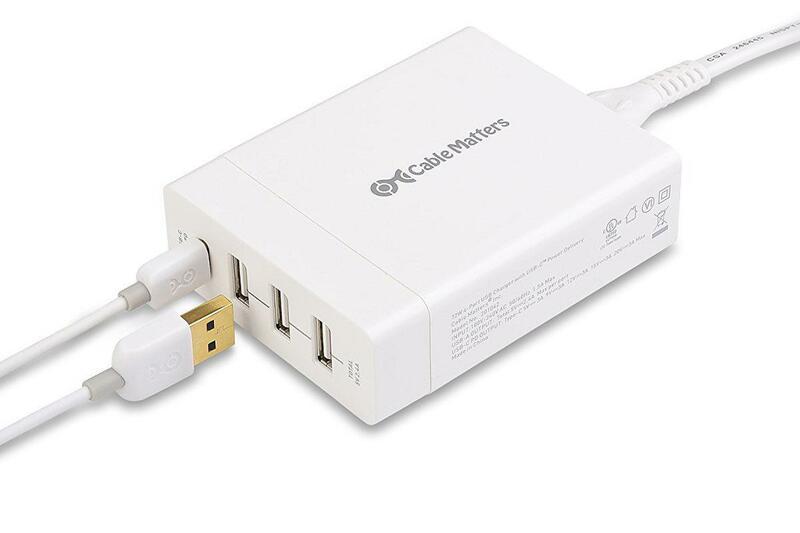 If you’re looking for an affordable combination charger for your Mac and mobiles, the 72W 4-Port USB Charger with USB-C Power Delivery from Cable Matters is the way to go.